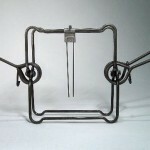 BODY GRIP 280 8.5" X 8.5"
TRAP DESCRIPTION: Bodygrip Traps are square, heavy steel traps which have two springs designed to hold strong animals. 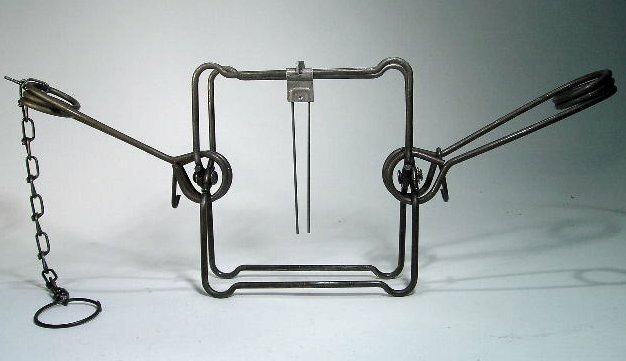 These springs are in the shape of a "V" and when set, compress the tops of each "V" together. There is a safety latch on each "V" so that once compressed, you can latch it to hold it safely set. Once both "V"'s are compressed, you set the key into the groove of the trigger. Now, place the trap where you want to make the set. Once in place, the safety latches are released and the Bodygrip is ready for it's target animal. Because of the strength required to compress these "V" springs, it is generally suggested that you get a pair of Setters for making the set. These will give you much needed leverage so the act of compressing the springs will be easier. This trap will kill target animals quickly and can have quite an impact on local nuisance wildlife when installed properly. RATE OF APPLICATION: This will vary from job to job. Generally, the more traps employed, the quicker you catch your target animals. Although you can start with only one, it is suggested that you use 2-3 where you can and more if you have ten or more nuisance animals being targeted. Comments on BODY GRIP 280 8.5" X 8.5"
A very good trap, very strong, must be careful with this one. Its a "must" to have a pair of setters for this one.